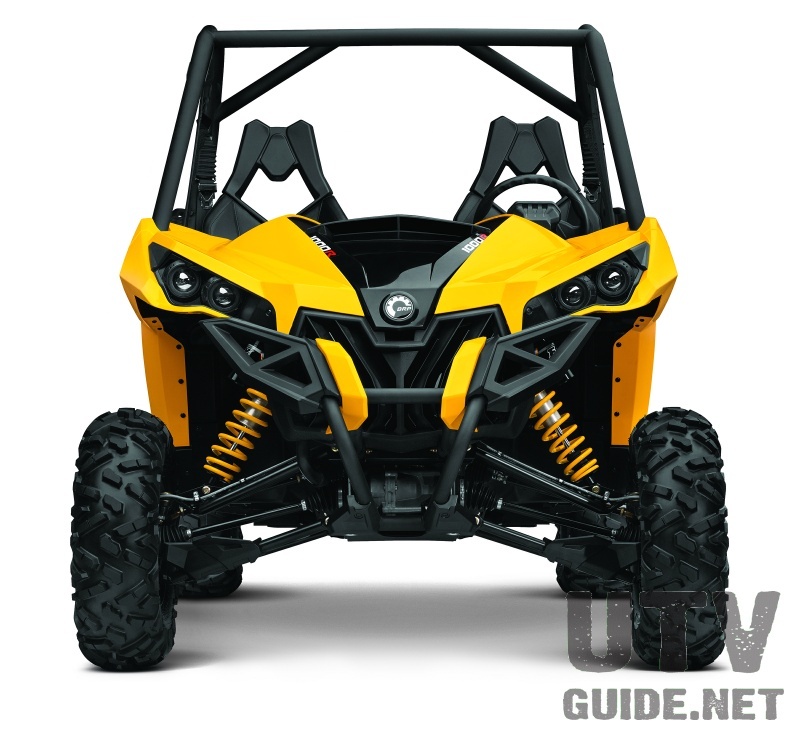 New for 2014 is the addition of Tri-Mode DPS and Visco-Lok QE to the two-seat Maverick 1000R X rs model. 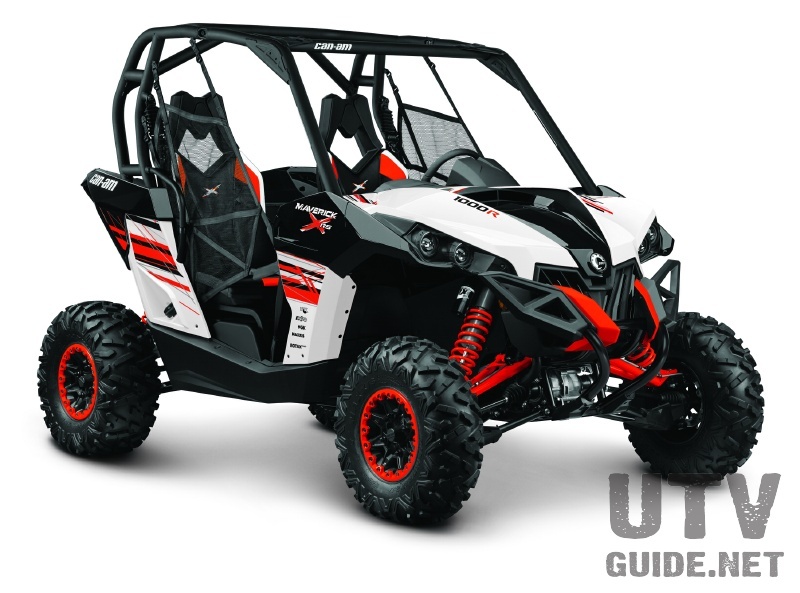 The X rs vehicle also receives the full line of X-package upgrades including, fully tunable FOX 2.5 Podium Performance shocks, 12-inch color match beadlock wheels, X-package seat trim, mudguards, steering wheel with brushed aluminum center, rock slides and two color choices. 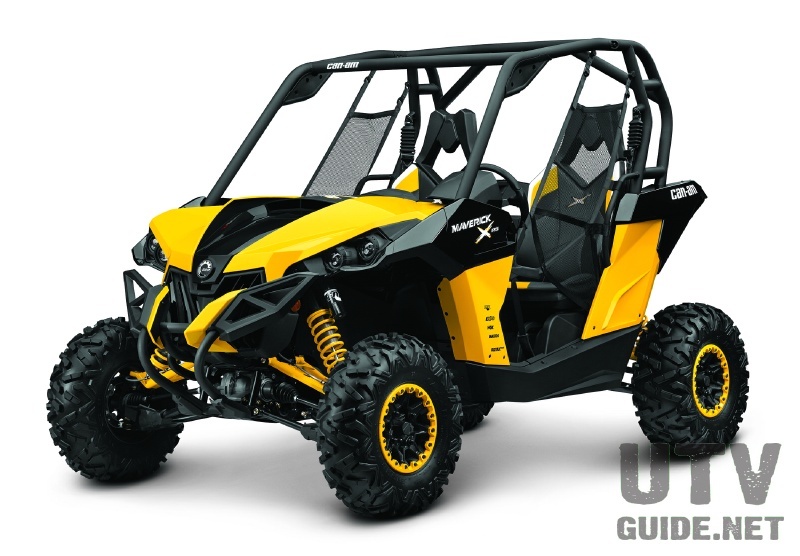 Choose between the carryover black-and-yellow color scheme with X-package graphics and sponsor logos and the all-new white with Can-Am Red and black highlights. 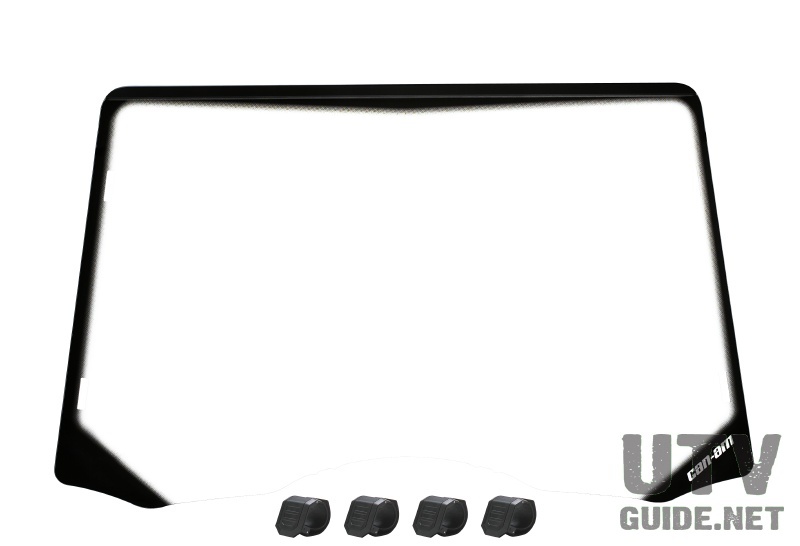 This model also receives the full X-package gauge upgrade. 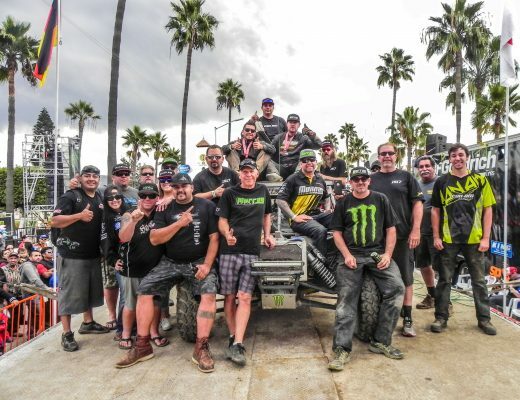 The Maverick 1000R X xc DPS vehicle is inspired by the proven Renegade X xc platform. 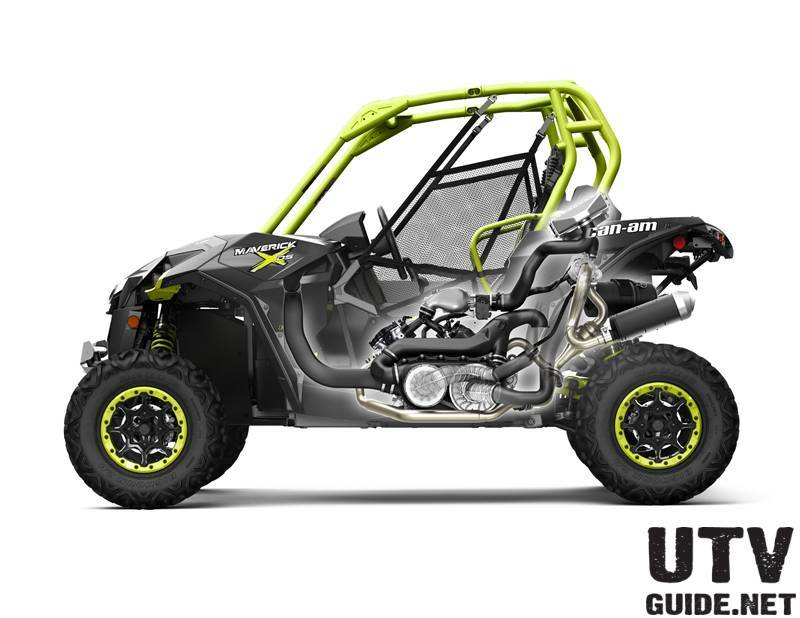 The all-new X-package Maverick includes a narrowing kit (60-inch width), tri-mode DPS, Visco-Lok QE and FOX 2.0 Podium X Performance shocks with 12 inches of travel for precision control in tighter woods and trails. 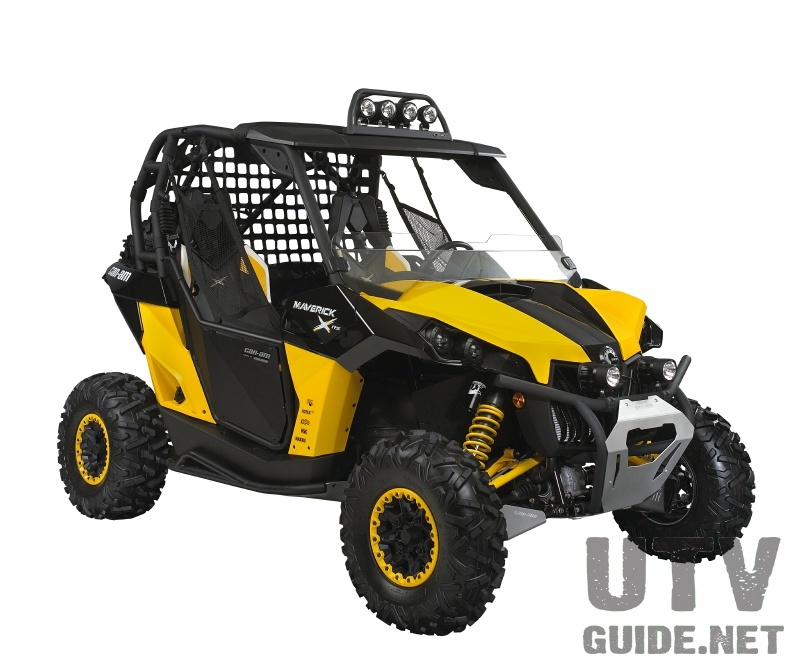 Utilizing feedback from Can-Am Maverick side-by-side racers who compete in the Grand National Cross Country (GNCC) series, the 1000R X xc is built to perform and also includes X-package graphics, seat trim, brushed-aluminum steering wheel, rock sliders, color-match beadlock wheels and the new gauge assembly. 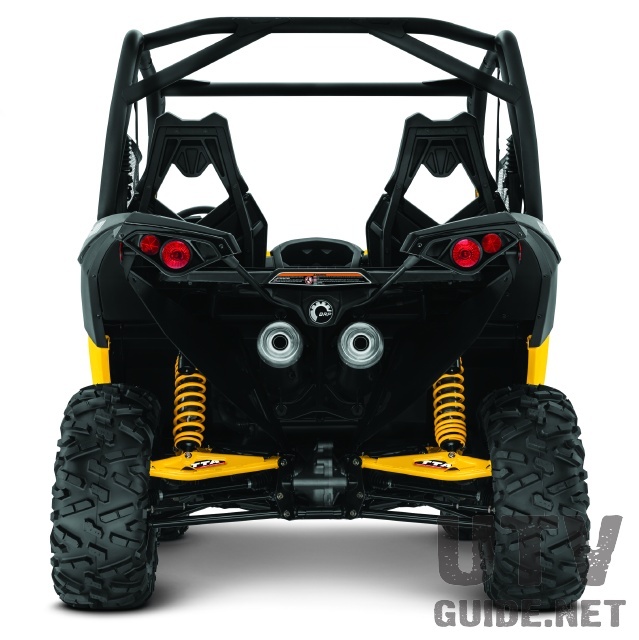 The double A-arm front suspension front suspension features 14 in. (356mm) of travel for a capable and precise ride. 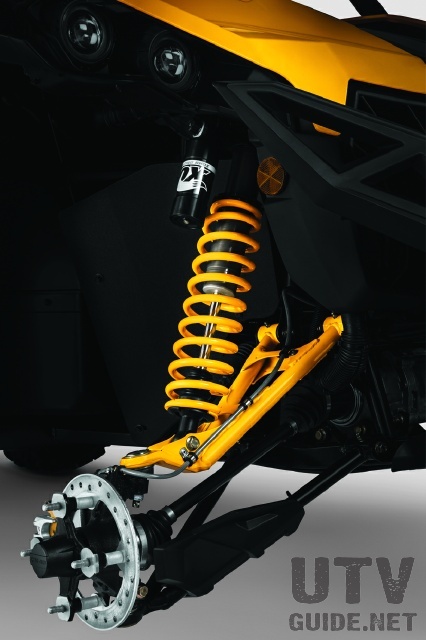 The innovative TTA rear suspension on the Maverick 1000R is engineered to be compact, lightweight, efficient and deliver the performance sport enthusiasts demand. 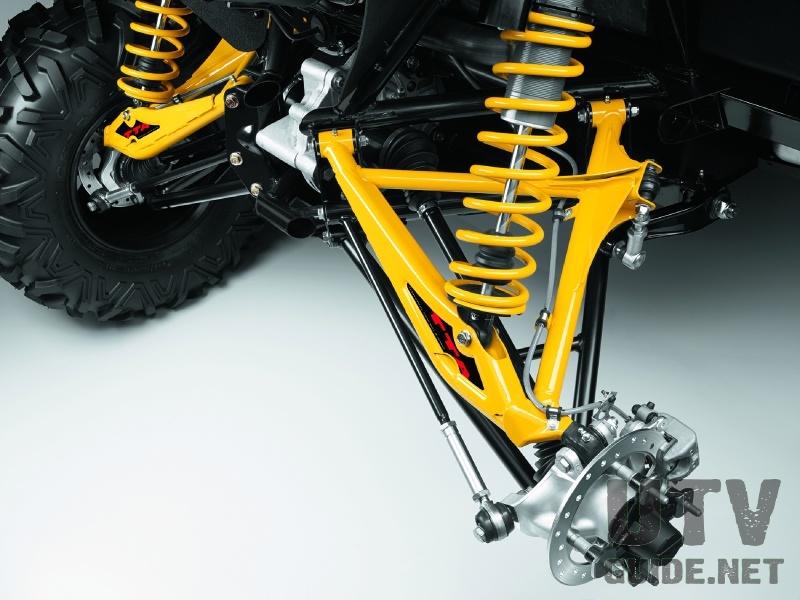 This is a compact version of a five-link suspension for no bump steer and the lowest scrub for optimized bump absorption and tire-to-ground contact. 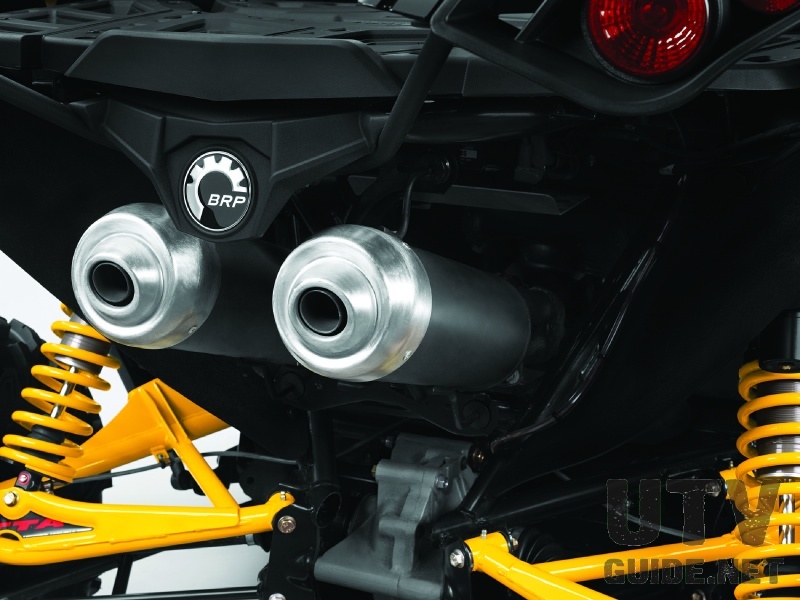 It also has less rear unsprung weight than other sport side-by-sides. The system features a double A-arm setup where each A-arm acts as two links and uses a toe-control link as the fifth link. 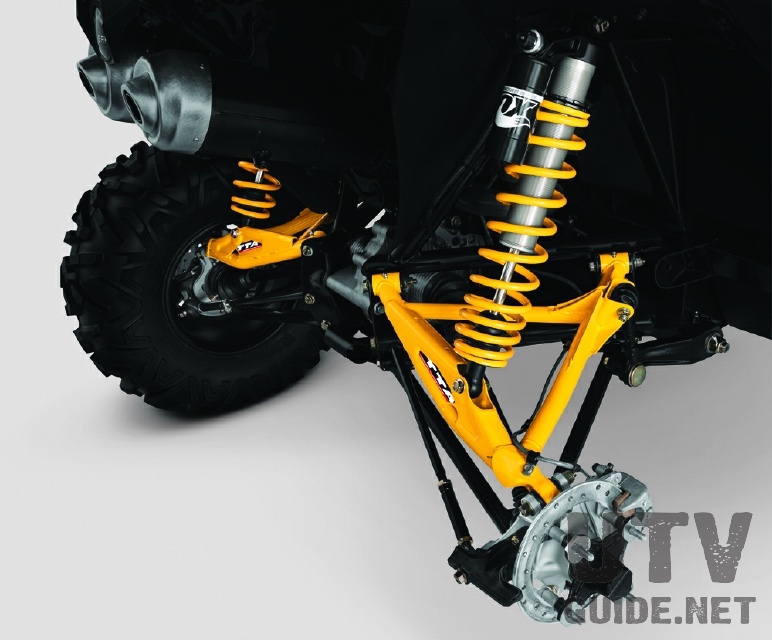 The result is a more condensed and lighter package with less pivot points and spherical ball joints making it more durable because it reduces free play and wear, and is more resistant to undercarriage damage. Engineers designed the TTA to allow for optimal geometric weight transfer to enhance the tire-to-ground contact, while at the same time increasing its bump absorption, traction and, ultimately, overall control of the suspension. Offers 14-inches (356mm) of travel. 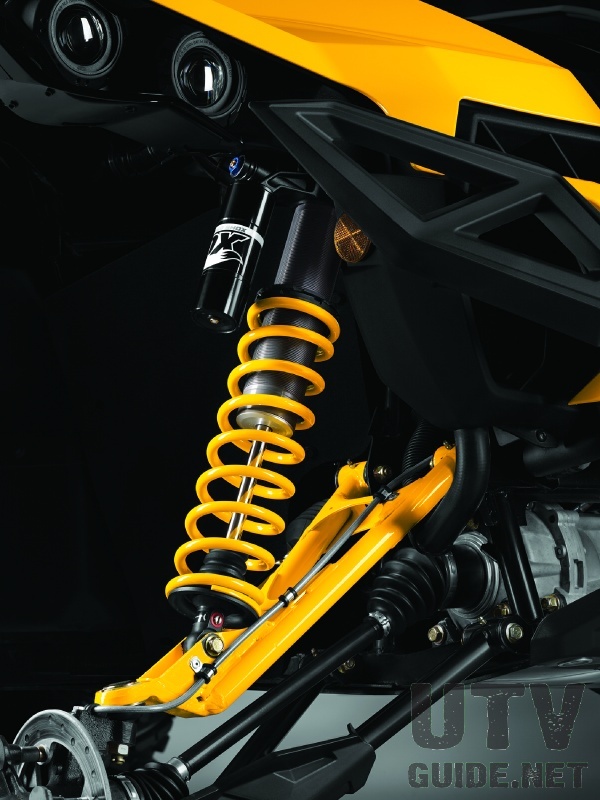 The Can-Am Maverick features front and rear FOX Podium X Performance 2.0 HPG piggyback shocks with compression and preload adjustments so you can setup the ride to whatever playgrounds you choose to tackle. Re-buildable design allows for easy service and valving changes. This shock features dual-rate spring, high-volume 6-inch (152mm) piggyback reservoir, velocity sensitive damping control, hard-anodized aluminum body, forged piggyback body cap, hard-chrome plated heat-treated shaft, upper and lower bearing mounts, racing-developed high-flow piston and specially formulated oil for optimal performance at variable temperatures. This stylish center-less cast-aluminum wheels were computer-optimized to add strength and durability in strategic areas while eliminating excess material in other spots to reduce unsprung weight. 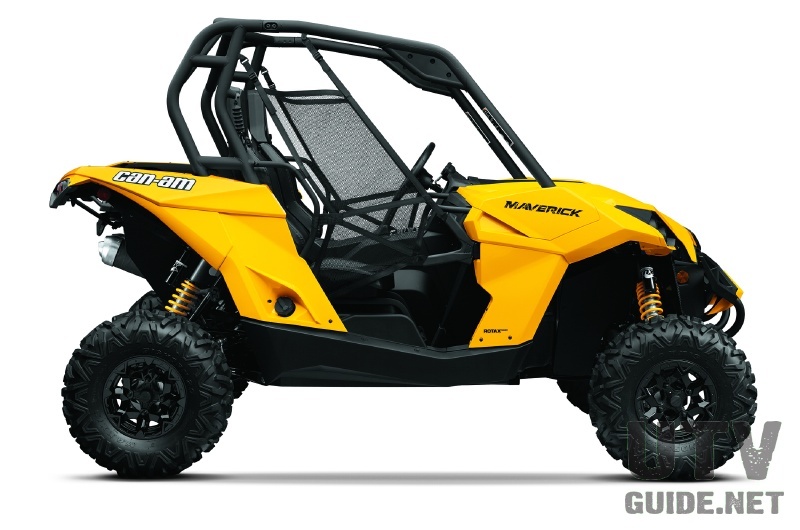 The Maverick 1000R base model is available in yellow. L x W x H (in.) 118.8 x 64 x 74.2 in. 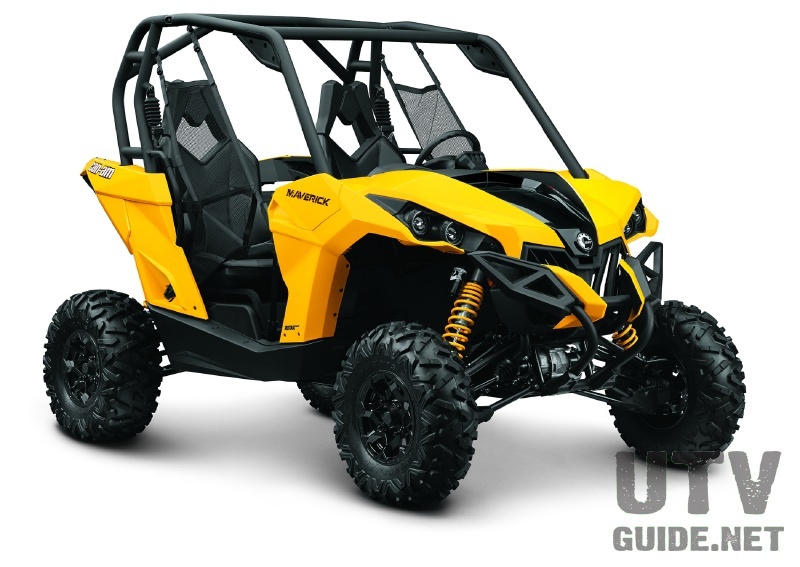 The most powerful side-by-side vehicle in the industry, theCan-Am Maverick is a force to be reckoned with, and we have the accessories to enhance your riding experience even more. Make the best side-by-side vehicle even better with these essential add-ons built rugged and designed for easy installation, and see the difference genuine Can-Am Off-road Accessories can make. Because you never know where youll be when misfortune strikes, the cool look- ing Baja Style Spare Tire Holder could save your day. 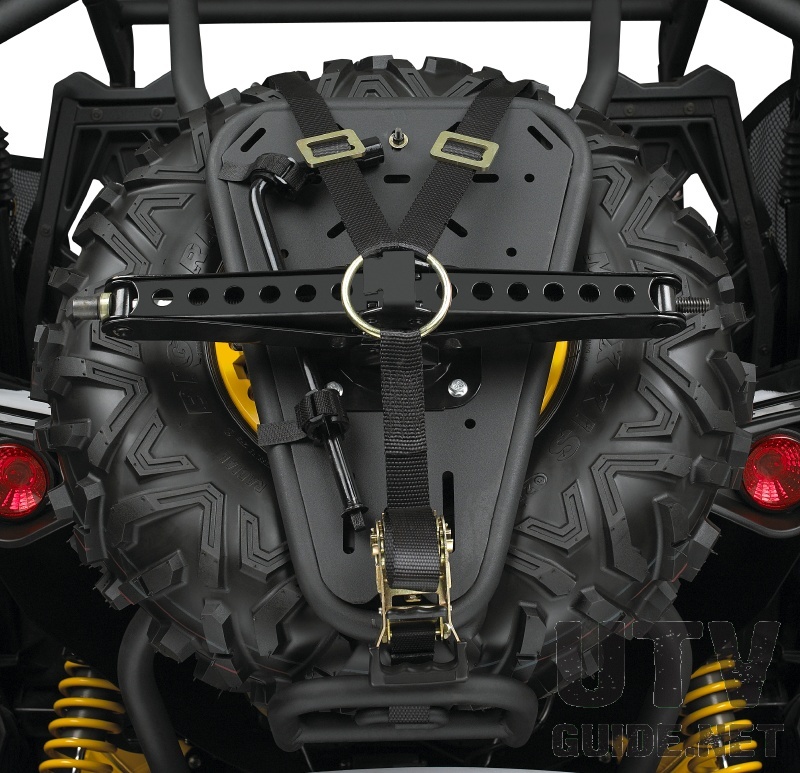 Its design allows for fast installation and removal of the tire with specifically designed tie-down straps. 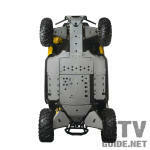 It is also compatible with or without the Wheel Jack. Without a doubt a must-have accessory to change a flat out on the trail. 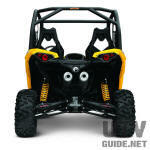 Its large base offers more stability, even on soft ground, and it includes a 17 mm wrench to remove the wheel nuts. These bolt-on doors are made of lightweight aluminum. 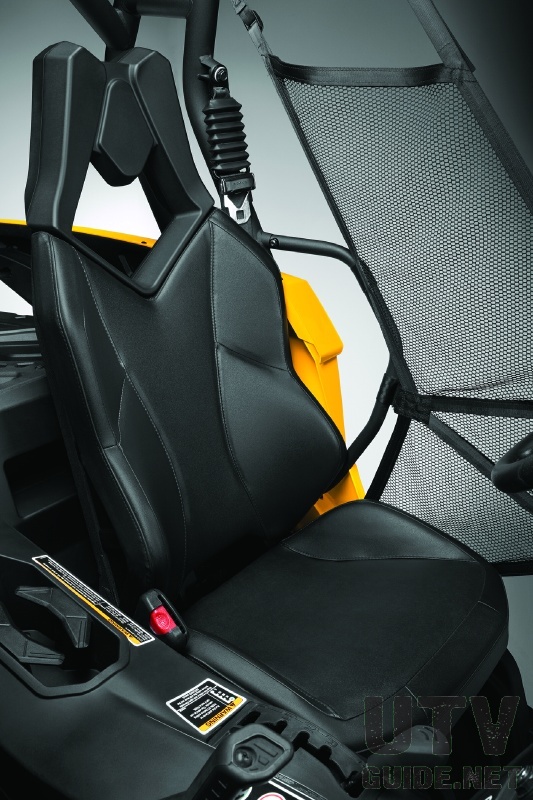 Designed to open wide and rearward, and equipped with a slam latch and door catch, they allow the driver and passenger to get in and out easily. Their powder coated black paint adds a custom and bold look that will get you noticed. 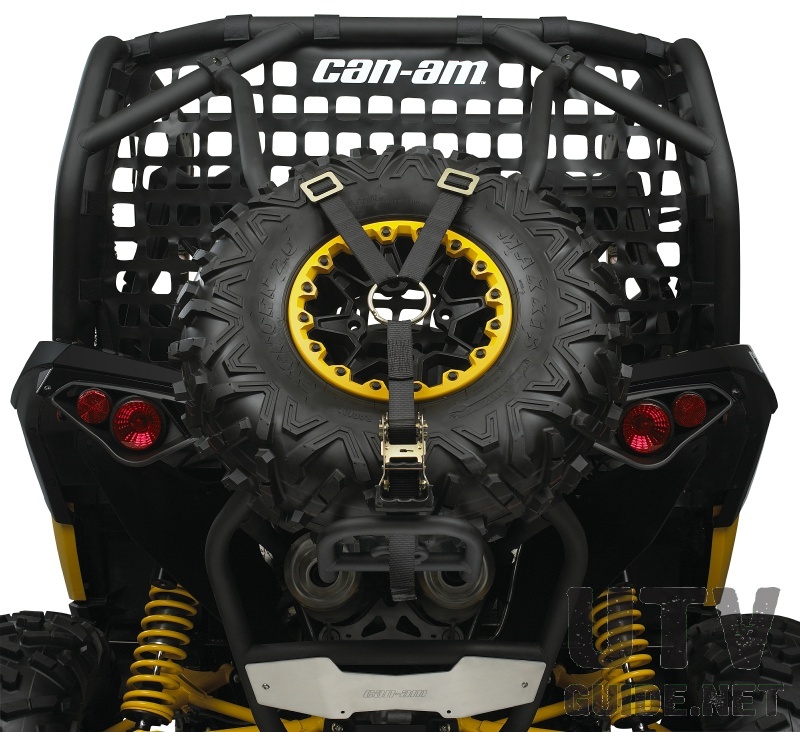 Can-Am branded 300-denier solution-dyed cover. Water repellent polyester construction. 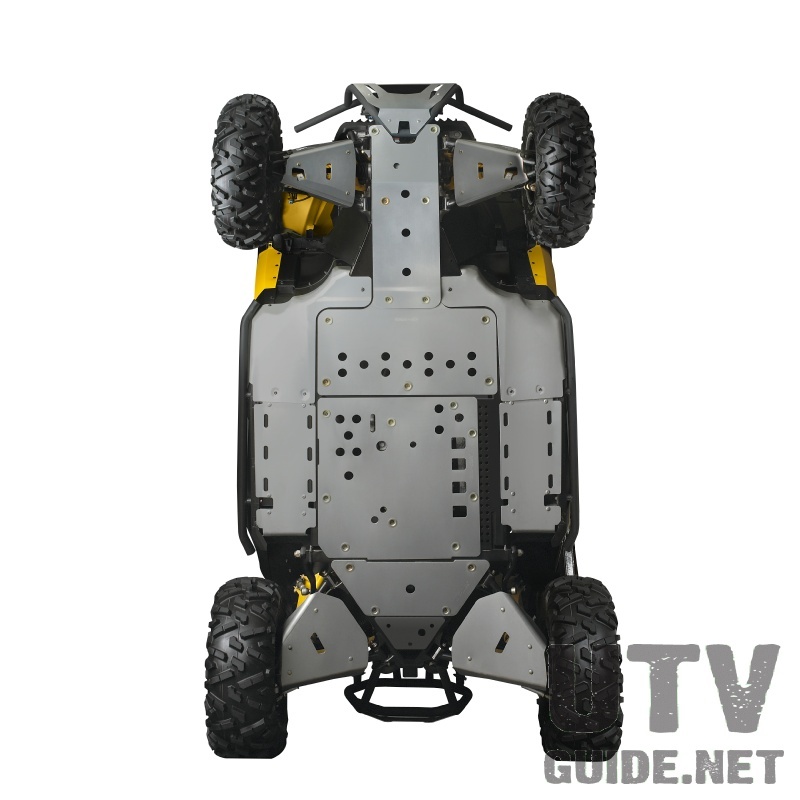 It fits with or without: roof, light rack, rear bumper, front bumper, side mirrors and spare tire holder. It has a trap for fuel and access to passenger area. 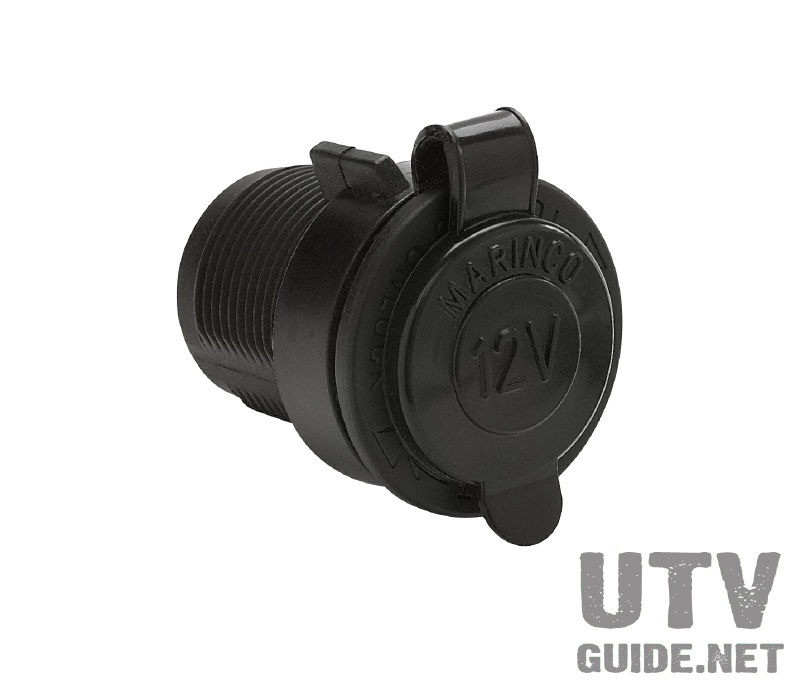 You can attach it securely to your vehicle thanks to the heavy-duty cord around the bottom. 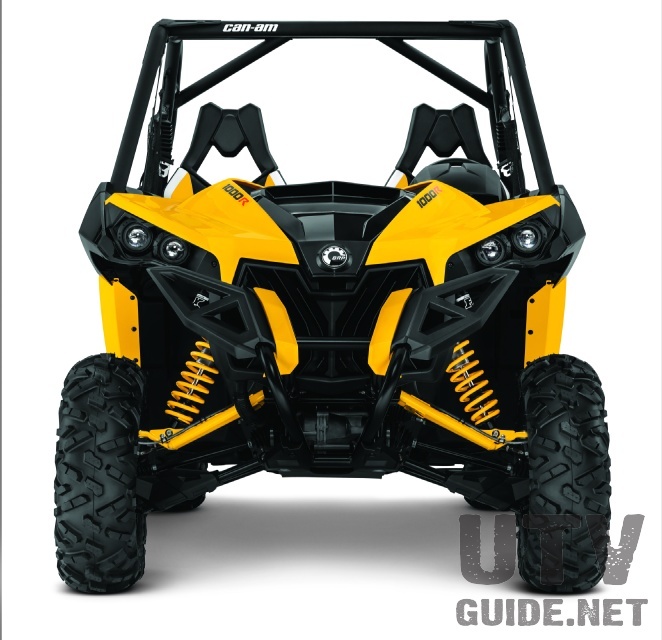 It features soft material in the windshield area to prevent scratches while trailering. 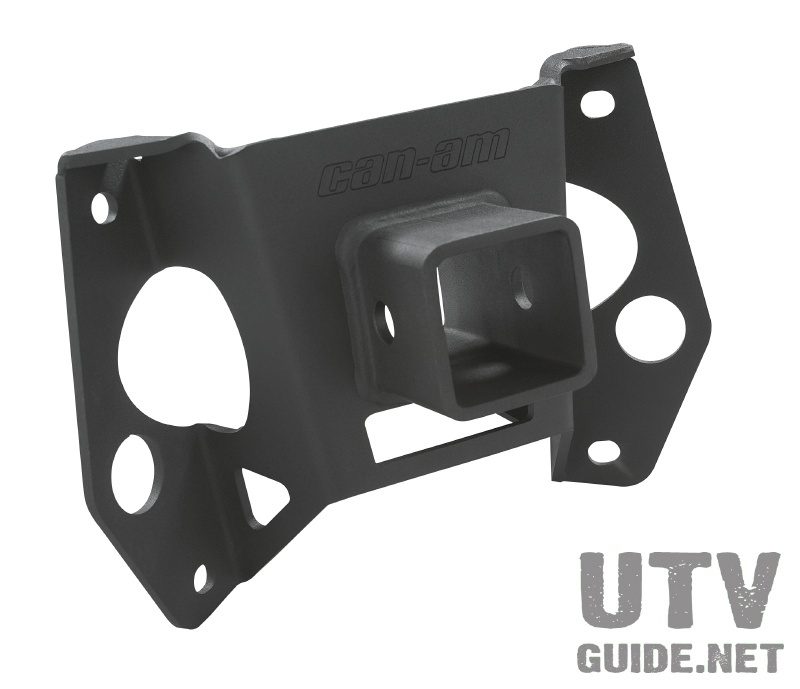 Heavy duty 2 receiver hitch, 1,300 pounds of pulling capacity. 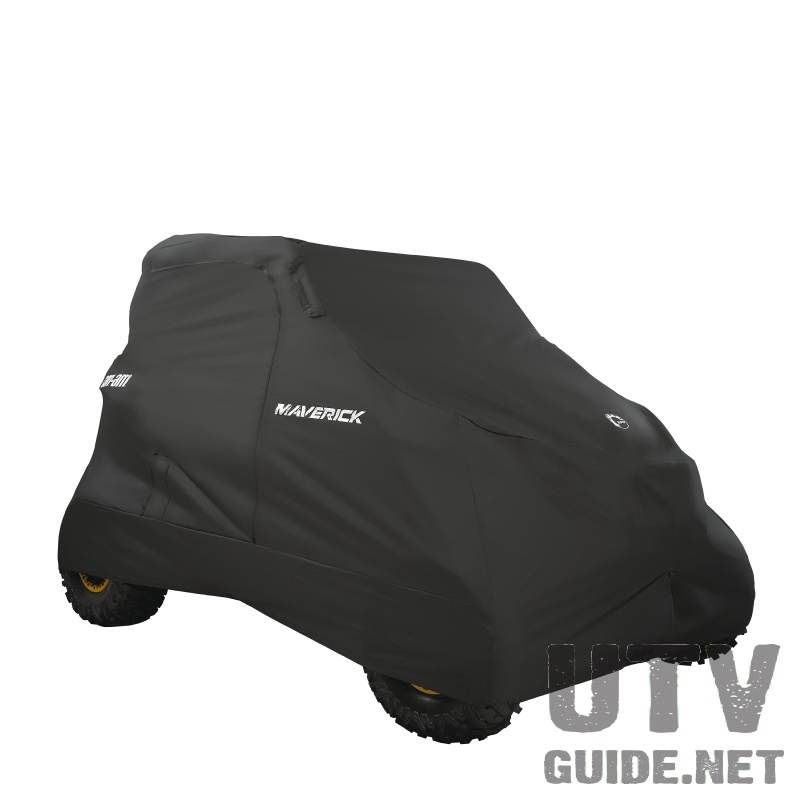 Made of durable polyethylene plastic with drain holes, it covers the rear end of your Maverick for endless cargo possibilities. With 4 solid mounting locations to attach your items, you can now carry almost anything you want and need, like a cooler. No tools required to install or remove the Cargo Bed Liner. 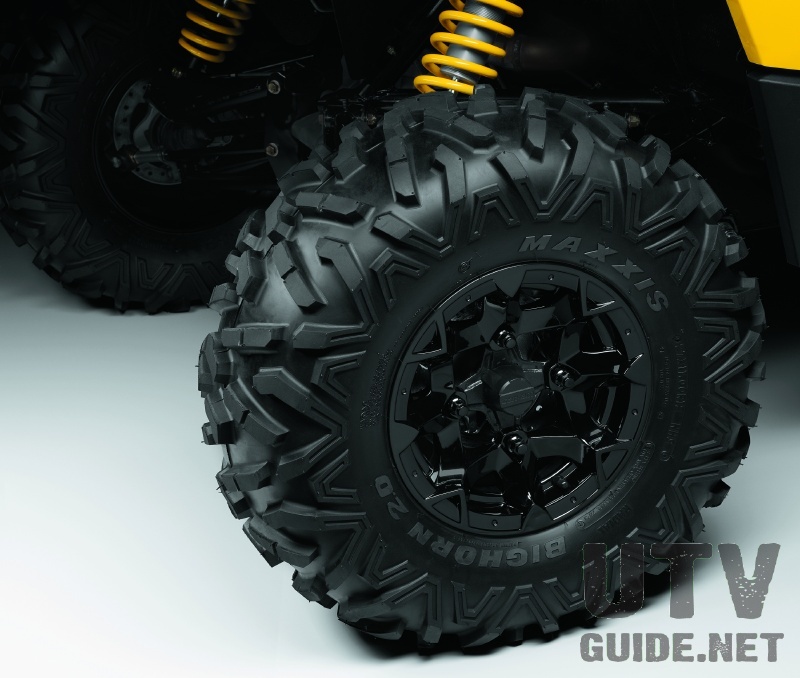 It can even be used with the Baja Style Spare Tire Holder. 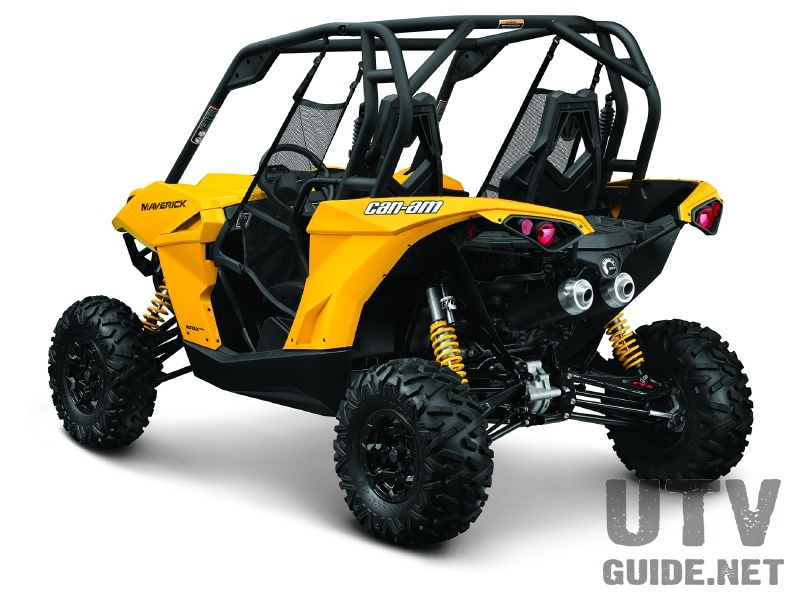 Adding a windshield to your Can-Am Maverick will give you instant protection against wind and debris while riding. 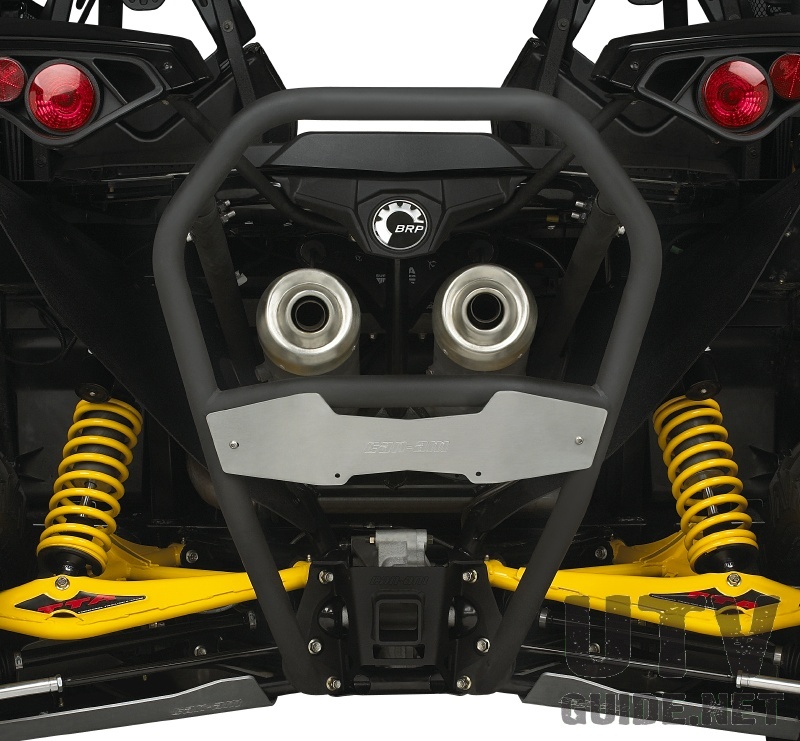 The Can-Am lineup offers three easy-to- install options to fit all riding styles and conditions. 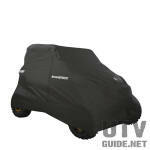 It combines the utmost in protection from the elements with optical clarity while riding. The hardcoated polycarbonate material on both sides offers better impact and abrasion resistance, as well as prolonged protection against wear- and-tear for a longer like-new look than acrylic windshields. 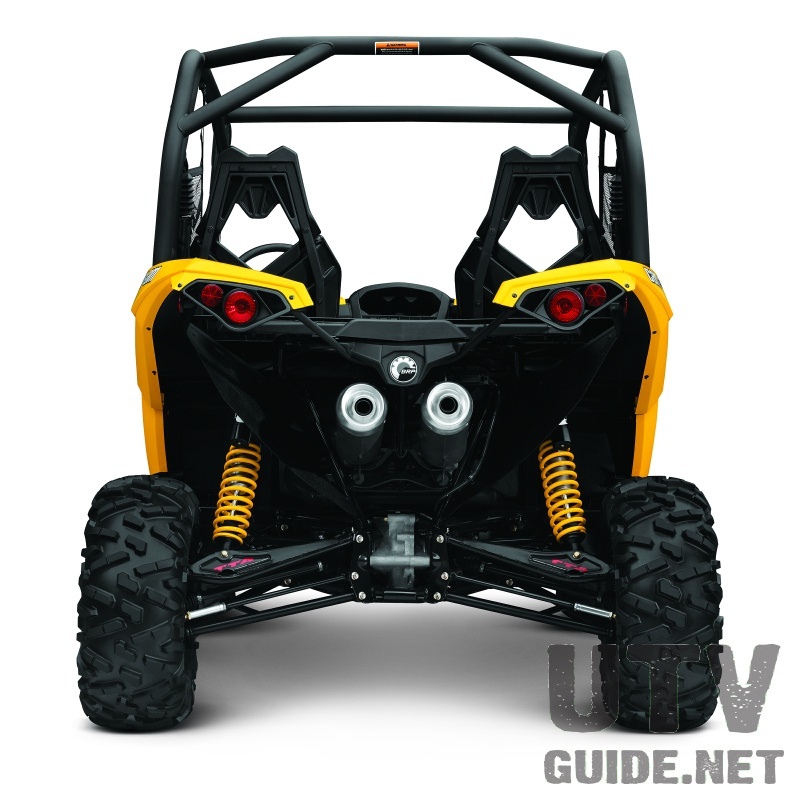 The windshield also features non-yellowing, non-crazing, non-cracking and UV-resistant properties. The quick-attach brackets procure fast, easy and tool-less installation and removal. Thanks to its durable polycarbonate construction, the Full Windshield is de- signed for optical clarity and better impact resistance than acrylic windshields. It also features non-yellowing, non-crazing, non-cracking and UV-resistant properties. The quick-attach brackets procure fast, easy and tool-less installation and removal. Designed for protection from wind and debris as well as optical clarity, the rugged, durable polycarbonate construction offers better impact resistance than acrylic windshields. It features a reverse angle lip to deflect air flow, and non- yellowing, non-crazing, non-cracking and UV-resistant properties. The quick-attach brackets procure fast, easy and tool-less installation and removal. Cargo box mounted 12V accessories outlet. Easy plug-in harness included. Practical for those electrical carry-ons. Heres a versatile accessory that lets you choose the level of protection you need to fit the moment. 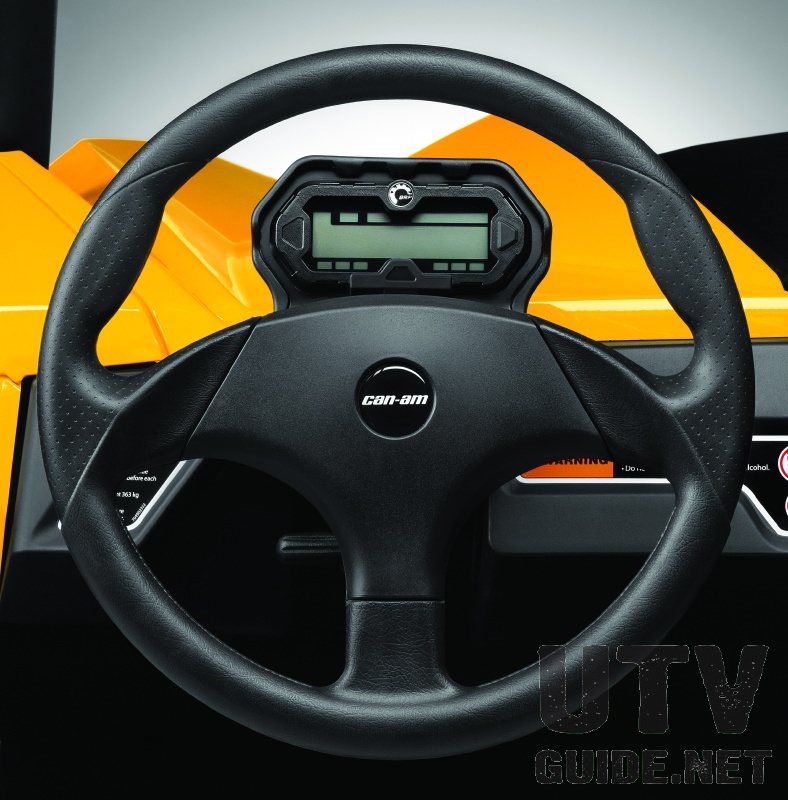 The soft top can be rolled up on the hard visor, allowing more air in and letting you enjoy the sun. 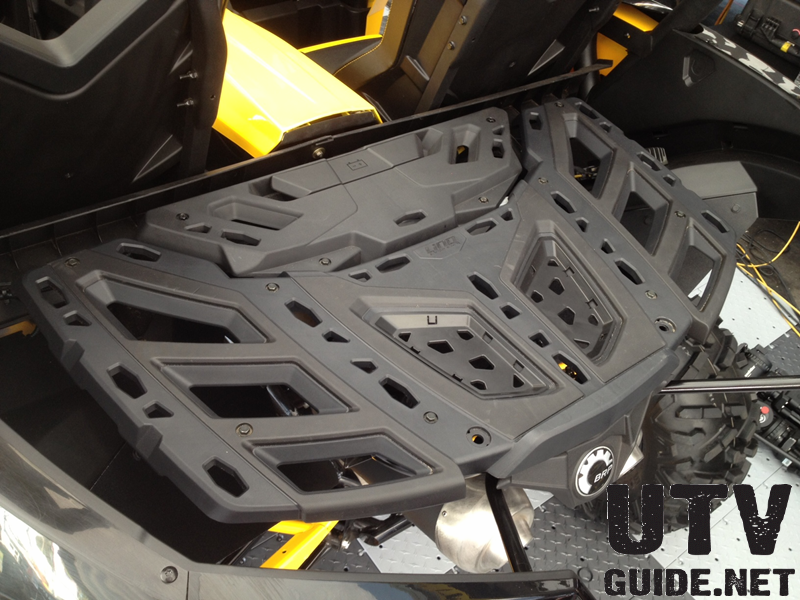 The hard visor also gives you the possibility of installing the Can-Am light rack, for extra lighting and a custom look.